No night surcharges – no holiday surcharges – no weekend surcharges – nationwide the same rates. Book your VIP – and luxury minibus now in a few minutes. Bavaria Limousines has the appropriate vehicle for you at all times. Whether fair shuttles or transfers to the has airport. 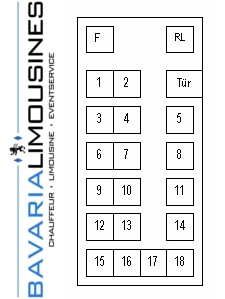 The luxury vans of the Bavaria Limousines GmbH & Co. KG are ideally suitable for all groups of up to 18 persons. Passenger Van Rental for 10, 12, 14, 15, 16, 18 Pax. Bavaria Limousines offer in the FRG a large rental car pool of VIP- and luxury minibuses nationwide. You’ll find the right vehicle for every event. Our busses are particularly favorable for fair and congress transfers, because they can shuttle up to 18 passengers conveniently and comfortably. All luxury vans have exclusive leather seats and offer partly besides the obligatory navigational aid and the air conditioning system a roof with a panorama view which creates a completely new sense of space. Additionally all our drivers speak English, are authorized for passenger transportation, show exceptional soft skills, and are regularly trained. On your demand we shall be glad to present you an offer tailored to your wishes and needs. Our logistics experts are on duty for you throughout the year and shall be happy to give you proper advice.